Today's picture was supposed to be one of the kids overlooking the badlands along with a story about how the Twins are facing their own little formidable trek. While everyone is focusing on the length of the trip and the road woes this year, I think it's worth researching just how the Twins have done on West Coast swings during the Gardenhire era. Maybe my mind is playing tricks on me, but hasn't this team consistently had one west cost trip each year that is a complete freaking disaster? I'm trying to throw these entries together on my iPhone, so I'm a little too lazy to do the research, but it seems like every year they finish one of these trips in complete implosion mode. For instance, the whole Hawkins & Eddie whinefest lead to one such trip I think. Last year's August swoon started on a West Coast trip. I seem to remember a 3-7 trip in early 2006, too. Those might not be something we fans remember, but the players and coaches likely do. Anyway, that's what I was going to write about. Instead, we got to our hotel, which had this indoor waterpark you see pictured above. 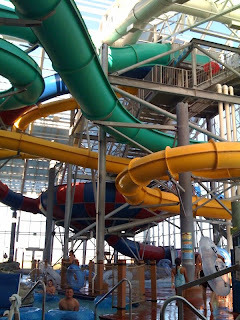 You see that twisting enclosed yellow water tube that's at least five stories high? Odds are that The Boy(TM) is somewhere in there right now. And I know this because he's been going up and down it like a turbo charged machine with a touch of OCD. But here's the thing: if you ask him, he will tell you that he's afraid of heights. And enclosed spaces. And the water. And speed. Am I missing anything? Oh yeah, the dark. That about covers it. But he LOVES water slides, provided he tries it just once. And today his sister got him to try it and a switch flicked on. He is shivering and blue because he's been doing that slide and five story climb as fast as he can for two hours now. He's our little go-go kid. You can't help but love him. The Twins love their go-go kid too, but they are still waiting for the switch to flick on. Carlos Gomez sat on the bench Sunday and Monday and I wonder what might have happened later on this week if Delmon Young hadn't hurt his ankle. Gomez probably would not have been the choice to send to go to AAA when Casilla was activated, because the only backup CFers the Twins would have had were not true CFers like Young or Nick Punto. But with Kubel hitting lefties and Ruiz available to DH, the Twins best lineup just doesn't include Gomez. What's more, it appears that Ron Gardenhire has decided that these 0-14 skids the kid has occasionally aren't exactly helping his confidence. Sometime within the next few days when the Twins confirm that Casilla and Young are healthy, they are going to want to callup a reliever from AAA, and it's going to be interesting to see who they pick to send down. The default pick has been Ruiz, but he seem safe. Given the health history of Punto and Casilla, it would be hard to release Everett. If they haven't released Lamb yet, they're unlikely to to lose their LHed bench bat just before Sept.
Sending down Gomez would be a tad harsh, but for whatever the reason, after five months in the bigs, the switch hadn't flicked 'ON'. They clearly love him - how can you not? - but necessity might require a week-long demotion until rosters expand. Has anyone else noticed that the Twins are 18 games over .500? And that the Sox are 20 games over .500? That means that even if both teams play only .500 ball over the rest of the year, they'll win 90 and 91 games respectively. So what's the new over/under on how many wins the AL Central champ or wild card winner will have? 93? 94? Which means that if the Tigers weren't dead in the water already, they are now. To win 93 games, Detroit would need to finish the season with a 31-4 record. BTW, that team is currently 3 games below .500. And the Yankees? Well, I won't count them out yet, but it's definitely uphill. To get to 93 wins, they'll need to go on a 27-10 roll. Even if two of the Rays, Red Sox, White Sox and Twins collapse to only 88 wins, they need to finish 23-14. If the fat lady isn't singing, she sure as hell is listening for her cue. Seriously - low 90s for the Twins or Sox? Who woulda guessed that? 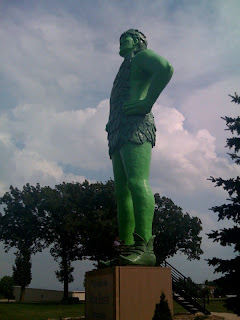 Maybe someone who realized that the midwest is the land of giants. Which brings us to today's iPhone photo from the Twins Geek Family's Summer Expetition. Enjoy!